Seeing lots of search queries bringing people to site looking for updates and advice on road conditions. Please add a note if you have a second to share what you know. Updating the update: Here are two votes for I5 vs. 99 once you do make it down from the Hill — Katelyn Hackett from Seattlest and WSDOT. Also, Madison is probably safest bet to I5. Update: Coming back from Sea-Tac? Southern approach to the Hill is advised in comments below. Take Rainier to 12th or 14th for a more gradually sloped approach to Capitol Hill, then work your way toward home from the top. Sea-Tac is a disaster. Making a few calls to see if the Madison to I5 route along the south side of the Hill is doable for anybody braving it. Metro says they’ll be at half capacity again on Monday. City has updated its safety and services info like trash/recycling. 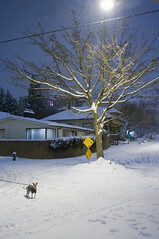 Seattlest’s MvB lives covered the lastest storm’s impact on CHS from end to end in this photo essay. There are several new snow and ice photos added to the CHS flickr pool. I’m tucked away here in frozen Alaska watching the crazy reports and pictures. Hard to believe I’m seeing Capitol Hill in some of these. Here’s what we know (and some of what we don’t) thanks to comments, below, and the rest of the online universe. I’m going to leave this post in place to continue the conversation. Be safe out there. 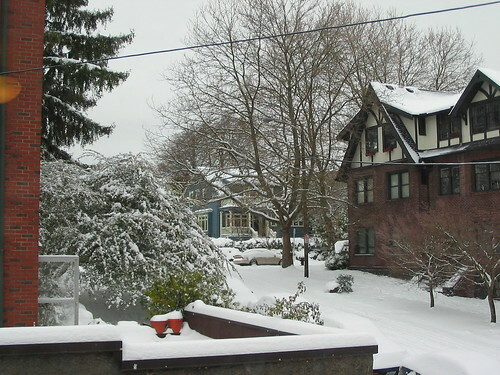 Somewhere between 4″ and 6″ fell in the Capitol Hill area overnight. Maybe 9″ since it all began. Metro says service cut severely today. Here is their adverse weather page for what it’s worth. 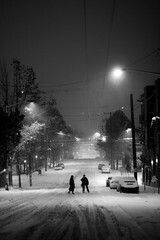 Latest Capitol Hill snow pics from flickr. Here are some pictures from Blogazar.com of a walk around the Hill after the bars closed last night. I’m missing the fun that’s supposed to hit today. So keep me posted on how this all shakes out. Starting to see some snow falling – light but consistent – 2:30pm. Going in earnest now. come on 6 inches! 3:30pm. Lots and lots of little flakes are falling. Just got back from QFC for a last-minute stock up. Top 3 items in others’ baskets: 1) Duraflames, 2) Chips and salsa, 3) booze. It’s going to be a fun night. I just got back from QFC with those exact items PLUS a frozen pizza. Still just light flurries. Anyone know what paths off the hill are clear (for a car), or the best way to find out? if you need to get south, best way would be to take broadway south to Rainer. North, I’d say broadway to 10th ave E.
But leaving quickly would be a priority. Also, cables for tires are only 40 bucks! I hear some cars (and one very large tour bus) starting to struggle getting up Madison around 19th (going west). Madison Market is closing at 6pm. Lots of people out on foot. happy snow day everyone! get out there and enjoy it!! Made it up from downtown on Pike, then took Madison to 19th. Also, sledding on Aloha between 18th and 19th IS ON. Metro now says the 10 and 12 are running again. Wonder how long that will last? I haven’t spotted it on 19th, anyone else? Update: at 7:30, #12 trolleybus is running on 19th! beer and burgers at smith were excellent. not too crowded yet, either. great way to spend the snowstorm. Not only is 15th relatively drivable, most of the businesses up there are still open. That means you can get a hot cocoa/toddy after you go sledding on Aloha – hurray! here is a link to the City’s latest news release with info for Seattle residents about what they are doing and how to stay safe. I called the East Precinct’s main number and had a friendly chat about what was open/closed/dangerous and was ultimately sent down Bellevue to Pine>Boren> I-5 S. Good advice! Ooh that’s a smart way to do it! Glad they were helpful! Our local star atmospheric scientist, Cliff Mass, has a blog in which he comments and predicts local weather. How much would you say we’ve gotten so far? Also, can anyone believe Volunteer Park Cafe ran out of chocolate for drinks earlier this week? Crisis…has it been remedied? Thanks for the tips on getting off the hill…I am supposed to pick up my mother-in-law tomorrow at noon. I’m two blocks from Holy Names and just measured what’s on my patio table. Assuming we had two inches on there before this started, we have a solid six now, which means we’ve gotten 4″ so far. There’s no end in sight and it’s beautiful. I’m very, very happy there’s no wind. After last night’s mistake of falling asleep with the balcony door open (whoops) and waking up freezing, we finally turned on the bedroom heater for the first time since we moved here 1 1/2 years ago. Stinky! Anyone else burn off a bit of dust from the heating coils or are you still bravely tossing on a sweater and a pair of socks? 1am. Just got home from a very packed Smith. Huge snowball fight broke out on 15th and it look like several passing cars were pelted. 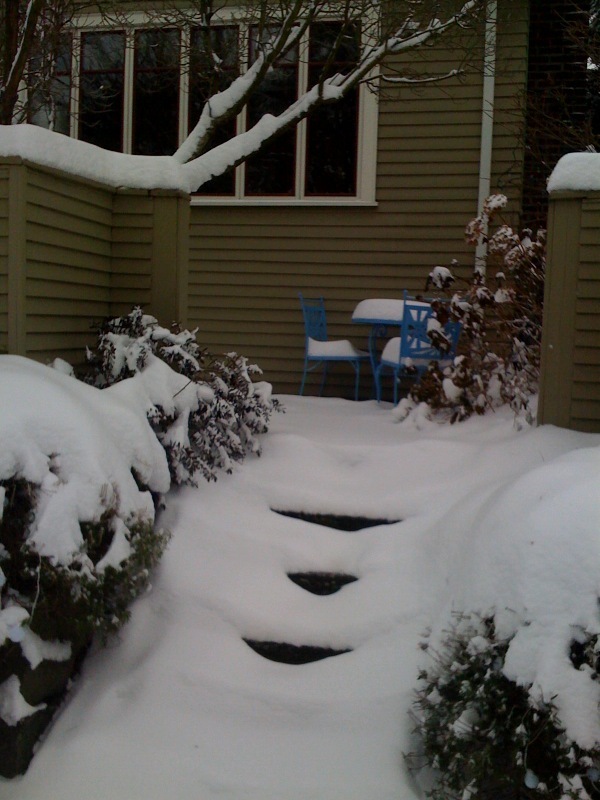 The snow is deep, like 5-6″. The wind is starting to pick up and we experienced at least 5-10 seconds of blizzard-like conditions on our walk home, or at least it felt like it at the time. There are fireworks and screaming on olive at bellevue, with various incidents of urination happening on the saint’s building. It’s nice that people are having so much fun out there! I keep seeing people go by on snowboards and cross country skis. I braved the Snowpocalypse and went to the Mercury. Turned out to be a good night for it – Santarchy came to visit. Santas + goths = awesome. So that’s what was happening! Looks like fun! #2 below by joshc who also landed a great pic on the Slog. 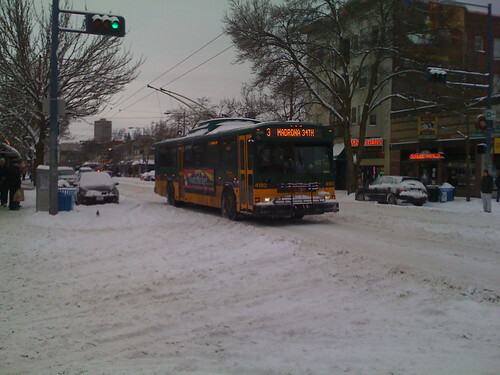 #48 buses (on snow route) are regularly passing E. John Street at 20th: single or bendy diesel buses with chains. (and the 43, together with the 8,11,12 are suspended now, anyway). A quiet relaxed dinner at the Elysian last night: few customers, lots of staff. And wonderful big windows to watch the flakes floating down. New snow falling – 11:40am Sunday. I measured a total of 9-1/4″ of snow on an untrod-portion of the sidewalk on 18th Ave. East. I just saw a 48 blow through a red light at Broadway & Harrison. Maybe they don’t have stop lights on the normal 48 route? We spotted the 3 and the 4 on Broadway on Thursday! What are the chances of that 3 getting anywhere close to Madrona and/or 34th? After an entire day I returned home with the fam around 6:30 pm. The roads were pretty tough in our front wheel drive Mazda. I5 was ok the problems occured when I tried to get up the Hill (to the eastside). I choose poorly by taking 520 to 23rd…ending up almost cresting the hill to Aloha before sliding in place. Quite a few cars were stuck trying to get up 23rd. I turned around and up going downtown via 520 and I5. Exited at Union and we came up Pike, it was touch and go but we eventually made it to 19th and Madision and home. I cursed many a red light coming up pike to Madison. Thanks for the info Dave. My husband gets in from Minneapolis at midnight…awesome. So, not up 23rd, and maybe not up Pike? Has anyone exited the freeway earlier and come up from the South through the ID? I took Rainier north on thursday (from i90), it has to be the gentlest slope up the hill, and you can get to 12th pretty easily, just look out for folks going downhill at intersections. If you need to get to 17th/18th south of union, go north first on 12th (past pike/pine), and try to wiggle up to 15th/19th, then go back south. I asked on Twitter and sounds like the approach from south is way to go. Q: Is it legal to drive a snowmobile on city streets? A: Yes, in some cases. The rules are defined in section 46.10.110 of the Revised Code of Washington, though additional city regulations may apply in some areas. # When traveling along a designated snowmobile trail. The penalty for violating this law? $134, according to the Washington Traffic Safety Commission. AliceE, were you in West Seattle recently? Huh – W Sea scoops The Hill. I’m Looking to purchase Entertainment Centers or TV Stands For a new boutique hotel I’m working in. Can you guys give me a good recommendation of where is the top deal on these? I live in Kansas and I heard that the big thing about these things is the cost of shipping and installation.